Any modern battery has a lifetime of no more than 5 years. However, if you properly and timely carry out maintenance of this device, then this period can be extended to 7 or even 10 years. How is this possible? Let's see. Damage or breakage of the battery always entails a number of other consequences. A number of factors that directly affect the reduction of the service life and premature failure of the device can cause this. There are objective and subjective factors, the first arise independently, the user himself creates the second. Therefore, the driver, first, needs to prevent the emergence of objective, and not provoke the emergence of subjective nuances. This will help to avoid damage and, accordingly, extend the life of the car battery. 1. Air temperature during battery operation. Using a battery in both heat and frost adversely affects the state of the battery, more precisely, the electrolyte in it – it freezes or evaporates, this is especially common in discharged batteries. Poor operation of this component or lack of it leads to a decrease in battery capacity, because of inappropriate functioning or complete cessation of equipment operation. 2. Battery charge level. If the driver recharges the battery for a car, then it can adversely affect its service life – it will significantly decrease. This can also be seen during an insufficient charge or long-term discharging of the battery. 3. Corrosion processes and sulphation. Corrosion is one of the negative factors during which battery cells from metal oxidized. Sulphation is unpleasant process, during which the electrolyte decomposes into water and salt, with the second component settling onto the plates in the battery. This leads to a decrease in conductivity and battery capacity. 4. Car electronics. Malfunction of the car’s electrical system also adversely affects the car battery. This refers to the generator that supplies the voltage to the battery. Therefore, when the voltage rises, the electrodes inside the device destroyed, and «boiling» occurs. These factors directly affect the life of the battery, so they should be taken into account and try to avoid while using the battery. How do we prolong the battery life? Regarding the recharge of the battery, when the electrolyte boils, then it is better to use an intelligent charger, through which you can control the time and level of recharging. In the absence of such a memory, it is better constantly monitor the process of charging the battery. adjust the performance of automotive electronics – they should not exceed 12V, maximum – 12.6V. In order to control the voltage, it is necessary to measure this indicator from time to time. It should be noted that this process controls the voltage regulator and, if the generator supplies normal voltage, and the battery «boils», then the problem with this regulator is to replace it with a new one. It is not difficult to adhere to these rules; as a result, the battery will work harmoniously for quite a long time, without occurrence of malfunctions and other unpleasant situations. Regular inspection and maintenance of the battery – the key to its long-term operation and normal operation. To do this, you need to follow some recommendations of experienced motorists and specialists in this matter. 1. An external inspection always carried out when the driver opens the bonnet. If there are any external mechanical damage, then they can be immediately seen and promptly repaired. 2. Cleaning and wiping is also carried out frequently, because then the battery will last longer than when the device is stained with electrolyte. After cleaning, you need to check the contacts and terminals, if they are weak, then they need to be tightened. 3. It recommended checking the electrolyte density every month; it should be 1.28 g/cm3. If this figure is lower, then salt has already begun to settle in the battery. 4. To avoid sulfation, prophylactic desulfation can be performed once a month. For this, a low charge mode is used, and the charger must have a desulfation mode. 5. An important indicator also considered the level of acid; it should reach to the edges of the plates, even higher by 1 cm. If its level is lower, then you need to add the missing amount of the substance. 6. The internal plates of the battery can crumble, this process called «active mass loss», and this leads to a decrease in battery capacity. This process can be prevented by firmly and firmly fixing the machine battery. As you can see, it is simple – to monitor the condition of the battery correctly in order to avoid premature wear or failure of the equipment. In the event of a breakdown or a quick replacement if necessary, you can choose the best option on our website. The online store catalog presents a huge range of models – from gel to calcium and hybrid devices. 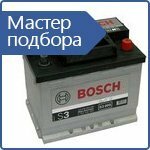 You can buy car batteries in Kiev, Kharkov, Odessa on 130.com.ua with delivery in Ukraine. Looking for a quality and the best batteries for cars? This rating of batteries for cars is made on the basis of such parameters as: high demand with positive feedback from our customers, high-quality manufacturing — absence of factory defects and service calls, and official warranty and post warranty support in Ukraine. The wizard selection you can easily choose a car battery on key selection criteria such as capacity, starting current, polarity and dimensions of the battery. 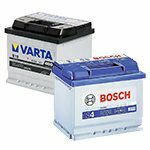 Batteries (battery) Varta and Bosch — our choice! When the cold comes, motorists face many problems: the engine does not start or the car battery is exhausted after a long parking in the cold. Learn how to choose a battery for a car, if the old one can not cope with its task. When frosts occur, the chemical processes inside the battery slow down and the overall efficiency of the battery decreases. Learn useful tips in this article on how to store a car battery and how to choose it right. Automobile gel batteries are gaining increasing popularity in the Ukrainian market. Let's consider the differences between gel batteries and lead-acid batteries and the features of these same GEL batteries. Car batteries - what to choose?